Recently the head editor of Shueisha's Weekly Shonen Jump, Masahiko Ibaraki, published a column on Nihon Keizai Shimbun called "25 Years of Me and Shonen Jump." In the column, Ibaraki talks about his life for 25 years as the editor-in-chief of Shonen Jump. I joined Shueisha in 1982 and was appointed to the Shonen Jump editorial department. Shonen Jump is celebrating its 40th anniversary this year and I've been spending 25 years in the same place. Each editor is assigned a mangaka to work with. The first mangaka assigned to me was Akira Miyashita. I feel as if my training as an editor came from working with the mangaka, not my superiors. When I was assigned to Mr. Miyashita, the editor who came before me worked with me for just one day and said, "You should do it from now on." I still remember how Miyashita looked when we first met. He was a tall guy with black glasses who said to me, "We should go out and get something to drink." To this day, the Shonen Jump editorial department has a tradition: each editor is given a large discretion. Even though I was pretty busy back then I still enjoyed those days. In my third year I was appointed to Takashi Shimada (story) and Yoshinori Nakai (art), also known as Yudetamago (*note: Boiled Egg), the pair that created Kinnikuman. I sat down with Mr. Shimada in a restaurant to discuss history, travel sketches, science and everything else. Over time Shimada would catch ideas. "This kind of monster fighter would be cool," we'd often say throughout the night. Afterward, Mr. Nakai would draw the pages without sleeping for a couple nights. After each individual page was completed, I grabbed it and ran to the printer's factory. I hardly slept but felt I was learning so many things. Sometimes receiving pages was a big thing. Over ten years ago, an editor called me the day before a deadline arrived and said, "My mangaka is missing!" We called his parent's home and checked all the places he could have went, looking for him all night. Shonen Jump has constantly been finding new talents. It is our source of power. 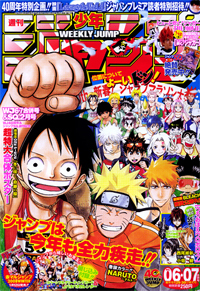 Established nine years after Shonen Sunday and Shonen Magazine, Shonen Jump could not start with big name contracts. The first rookie I worked with was Masaya Tokuhiro. He debuted in a year and became popular--I was so glad to see it and felt myself climbing higher as an editor. I also worked with Masanori Morita for many years. I met him when he was 15 years old, and he often came to meet us in order to show his manga. His artistic manga attracted me. I was very pleased with his debut even though he was still in high school. Manga editors work with mangaka to create manga. In the creation process, there are no "regular" steps or established rules. Editors are into creating cool manga titles with a passion. Of course there is tough competition between each editor since all of them are rivals. In 1982, when I joined Shonen Jump the circulation number was 25.5 million copies. Then the circulation grew as high as 65.3 million copies in 1995 because of hit titles such as Dragon Ball, Slam Dunk and others. However, after 1995 the circulation decreased constantly until last year. The circulation number last year was 27 million copies. We've seen good days and bad days, but I believe in a bright future for manga. Manga can be created with pen and papers, so it has unlimited possibilities. I hope Shonen Jump will keep producing cool manga with unknown talents like it has in the past. Submitted by Marco Milone (not verified) on Tue, 2008-04-01 08:34. Submitted by mangatoread (not verified) on Wed, 2008-04-02 03:57.